It’s a recurring theme in all Japanese martial arts –at least it has been in all the arts I’ve practiced or have been around: this technique, that movement or that step “comes from the time people fought in armor”. Especially in weapons arts, regardless of the years separating them from their ancestors, the armor influence is always there to remind exponents of their glorious past and their relationship to the samurai. And while this is all fine and dandy, I had always the nagging suspicion that, like its most famous accessory, the sword, yoroi (i.e. 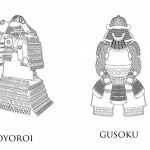 samurai armor) has been as much a victim of misunderstanding, misconception and even misappropriation as an actual source of inspiration and a practical influence to the martial arts as we know them today. I think the source of these misunderstandings is that like swords (and pretty much everything else related to the samurai), yoroi are cool –by any definition of the word. 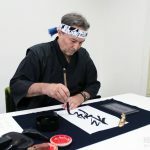 Or to put it more seriously, they make what we do –be it judo, kendo or some old school- a bit more different and a bit more worthy because they make us relate more to the origin of our art and because they make the art itself able to withstand the rigors of battle. 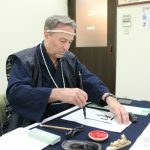 And even if we don’t really believe we are samurai, we deep down believe that through studying these arts we share some of their characteristics; that these characteristics are usually just our personal interpretations and themselves objects of misunderstanding is beside the point. 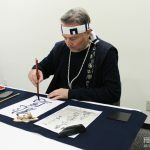 Having been involved with the martial arts of Japan for several years, I don’t exclude myself from the above: I’ve heard the stories and I’ve often wondered first if they are rationales or rationalizations and second, to the extent they are the former, how moving and fighting in yoroi really feels. Not because there is any chance of actually needing the knowledge in my everyday life (naginata, the weapon of my main study for the last ten years has been obsolete for the last 500 years so the ship of practicality has long sailed!) but because I was curious how the people who wore the yoroi worked around the practical considerations coming up in everyday practice. Let’s face it: if a 16 lb kendo bogu can hinder your movement what happens with an iron armor that’s double or triple the weight? Obviously the only way to put all this to the test is to actually put on a yoroi and see how it affects your movement; furthermore, and because this was supposed to be a piece of fighting equipment, to try a range of motion that goes beyond simple standing or walking and extends to the use of weapons and even grappling. It’s hardly surprising that yoroi are still being made in Japan and their cost, in the range of $2,000, is not only not prohibiting but even not as high as many would expect. Since it isn’t something that I would use on a daily basis (needless to say I’d love to have a suit anyway!) 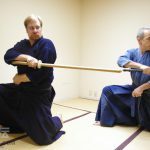 and since the whole idea was to see how “it works”, so to speak, for the needs of the test –and this article- we turned to one of the traditions that continue using yoroi for their practice: Yagyu Shingan-ryu Heihojutsu and its teacher, Kenji Shimazu. Anyone who has seen a classical martial arts’ demonstration is familiar with this school; as a matter of fact one of the things you often hear from inexperienced viewers is “How many Yagyu Shingan-ryu are there? !” because in most major demonstrations there are at least two. And indeed, there are two main lines, the Sendai line (from where the school originated) and the Edo line. Τhere are enough similarities between them in terms of etiquette, body movement/organization and technique to indicate that they stem from the same root going back to the times when the Sengoku Period was giving way to the Edo Period, a man named Hayato Takenaga and the Yagyu family which appreciated his prowess so much that besides teaching him their tradition they also allowed him to use their name as part of his school. On the other hand there are differences between the two lines and they are even demonstrated in their names: the Sendai line uses the word “heihojutsu” (i.e. strategy) to describe what they do while the Edo line prefers the word “taijutsu” to indicate the emphasis given on unarmed techniques. Since both lines have an extensive unarmed curriculum and several armed sets utilizing the sword as well as long weapons (bo, naginata etc.) my guess is that the naming is just a convention used for identification purposes. Τhere is a major difference though and it played a major part in bringing us to Shimazu sensei’s dojo: his line is the one frequently demonstrating in armor. This means that although the school has shifted its emphasis from katchu (armor) to suhada (“naked” i.e. plain clothes) since the Edo period, they still train in yoroi so they know how to move in it. First things first: before putting it on you need to know what to do with it! 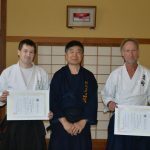 We were met at the dojo’s parking lot by Tomoyuki Yokose, long-time student of Yagyu Shingan-ryu (henceforth YSR) and Shimazu sensei and a well known writer in Japanese budo circles –anyone who has even browsed Nippon Budokan’s publications has certainly come across his name and his “Nihon no Kobudo” (“Japan’s Classic Martial Arts”, ISBN-13: 978-4583035864) is considered required reading to those who are interested in these arts. Yokose-sensei had brought the yoroi and the rest of the equipment we were going to use in our small experiment and this was our first exposure to one very important aspect of them: they are quite heavy! Even though the amount of metal used for Japanese armor is very small compared to that used in European plate armors, each suit weights at least 33 pounds and that doesn’t take into account the clothes worn beneath it (YSR people wear a light keikogi and nobakama but I opted for a samue) and the weapons which –at best- would add at least 5 pounds to the total. While waiting for Shimazu sensei, Yokose sensei was kind enough to offer us a quick course in YSR history and basic body mechanics; this wasn’t just to satisfy our curiosity: as there isn’t one way to use a sword, there isn’t one way to move in a yoroi and of course since this was YSR’s dojo, I would have to move in the YSR way. Of course, like all the articles in this series, my exposure to the school’s curriculum is superficial (at best!) but Yokose sensei was kind and patient enough to explain to me at least some of the key elements of their teaching method. Luckily, the system is organized in a logical way, with three basic suburi (solo exercise) categories (Omote Kajo, Chugoku Kajo and Otoshi Kajo), each having 7 variations depending on the opponent’s attacks (one lapel, two lapels, one hand, two hands etc.) and all contributing to the exponent acquiring the “Yagyu Shingan-ryu body”. For those interested, and with no intention of straying too far from our objective, Omote Kajo teaches the basic movements from right to left, Chugoku Kajo adds movements front and back, tai-atari (crashing on the opponent) and techniques that can be adapted to be used with short weapons (jutte, yoroidoshi, kodachi etc.) and Otoshi Kajo makes the movements more sophisticated, lowers the hips (something that will prove essential to moving in armor) and introduces movements that will be useful with medium length weapons such as a regular sword or a jo staff. As usually happens with solo exercises, the suburi’s movements become clear when performed “kumidori”, i.e. with a partner; and yes, most end up with YSR’s trademark “mukuri”, grabbing the opponent from the waist and rotating them a full 360 degrees; for those who have seen the move in YSR’s demonstrations and are wondering, it’s supposed to be a pile driver. Yes, this is an extremely uncomfortable piece of equipment! Shimazu sensei came as if on queue when our theory and practice introduction was over and we moved on to the main course of our visit: wearing the armor and seeing how movements and techniques need to be modified while in it. Although the armor YSR uses is rather of the later (i.e. Sengoku Period), lighter and much simpler version than the majestic o-yoroi of the Kamakura period often seen in museums, putting it on proved quite challenging and even Yokose sensei, who has been doing this for years, needed some help from his teacher. With the samue, already in place we moved to the tabi socks and waraji straw sandals, then to the suneate (shin protectors), the haidate (thigh protectors) after them the do and kusazuri (chest and back piece with plates protecting the groin and upper legs) followed by the kote (hand and forearm protectors extending up to the shoulders), the sode (big epaulets protecting the shoulders) and finally the kabuto (helmet) and its shikoro (guard for the back of the neck) tightly tied under the chin. 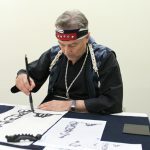 When everything was in place, we added the weapons: a tanto (normally it would had being a yoroi-doshi smaller dagger but the techniques work fine with the tanto as well) with a long soft obi sash tied around it and the sword mounted in tachi mode (i.e. with the edge facing down). First impressions? Yes, this is an extremely uncomfortable piece of equipment! Range of motion gets extremely restricted and dozens of movements you have managed to perfect through years of martial arts’ practice become obsolete just like that; what’s worse, this is something you realize as soon as you attempt to make even the slightest movement because various parts of your body seem to be stuck or knocking on any number of points, protrusions and hard surfaces. Yokose sensei had mentioned something about movement in armor being “robotic” and now it was perfectly clear what he meant. Just the idea that one should have to walk miles wearing this (and probably carrying other weapons as well as the medieval Japan equivalent of a military rucksack) and then having to fight for hours still in it, seemed pretty unrealistic. So, knowing from history that people did it for centuries, the question is how could they do it? Like most things, and not just martial arts’ related, the answer is, of course, with practice. Yes, it does work –but you need to know what you are doing! But it isn’t just any practice. As I mentioned before, YSR’s training methodology has been designed to make the practitioner become able to move in armor and this becomes obvious as soon as you put it on. Seeing the school’s techniques performed in regular clothes (i.e. keikogi and hakama) some of them don’t make much sense and some others make some but with the armor on, the whole system becomes clear: the body’s somewhat slouching position, the sideways stances with the head over the shoulder, the wide movements of the arms and the extremely low position of the hips (which, incidentally will have your quadriceps screaming for mercy after the first few minutes), the curved position of the arms in kamae like YSR’s characteristic yama seigan (one hand up in front of the face and the other in the chest), the double strike on the chest, the fists with the knuckles of the index and middle finger protruding, the flailing of the limbs and the many instances of leading with the elbows, they are all there to make movement in armor easier, to exploit openings in the opponent’s armor and to give the YSR practitioner efficiency and, in the end, a chance to get out of the conflict alive. Things became even more interesting when we started trying some of YSR techniques using the two weapons (tanto and tachi); “interesting” is the operating word because one sees immediately what works and what not. And perhaps not surprisingly, what doesn’t work is cutting –yes, we all have heard the exciting stories about how a Japanese sword is a superb cutting weapon but the truth is that when in armor, the sword’s cutting abilities become extremely restricted because the places where you can actually cut are very few and the opponent can easily neutralize your attack with a slight movement that will put some armored part of his body in your sword’s trajectory. 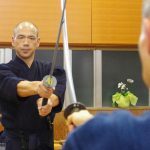 In katchu budo, blades of any length become for the most part stabbing weapons, used in unorthodox angles and kept very close to the body –the stances with the arms and hands extended we have associated with kendo, iaido (and the movies) just don’t work. Still, there isn’t a definite line in YSR between armed and unarmed techniques; and from what Shimazu sensei was saying during our small experiment, this isn’t just something happening only in the particular tradition. Yes, things start with weapons but the passage from medium to short weapon and from there to kumiuchi (grappling) is something that occurs from opportunity rather than by design. When we are discussing battlefield techniques (and wearing armor is a constant reminder of that!) survival is the only concern so anything goes: you might start with a sword attack, continue with an elbow strike in the face, follow with a throw using your knee as a fulcrum (losing your balance is very easy when wearing armor –one more invaluable lesson) and finish with a twist of the kabuto so the opponent gets choked by their own cords –or with a throat slash with your (or their) yoroi-doshi. Our little field trip lasted about six hours; not nearly enough to allow me to say that I understand what YSR is about but enough to give me an idea how all the other things I do and have done relate to the conditions of a battlefield conflict and a few pointers to look for the next time I hear some claim about how things were done when “people fought in armor”. I would recommend it to anyone practicing any Japanese martial art: it isn’t like anything you might have imagined and even though from my experience it is something that you can get used to if you practice not that long enough (as you can get used to anything), its difficulties and peculiarities will inform your body movement in ways you never thought possible. This small research project wouldn’t have been possible without the help of Kenji Shimazu sensei and Tomoyuki Yokose sensei of Yagyu Shingan-ryu Heihojutsu. They were genial hosts, offered us tons of information (and not just armor-related) and really helped us understand a really difficult and complicated matter. I hope the reader will not object me using this space to thank them from the bottom of my heart.